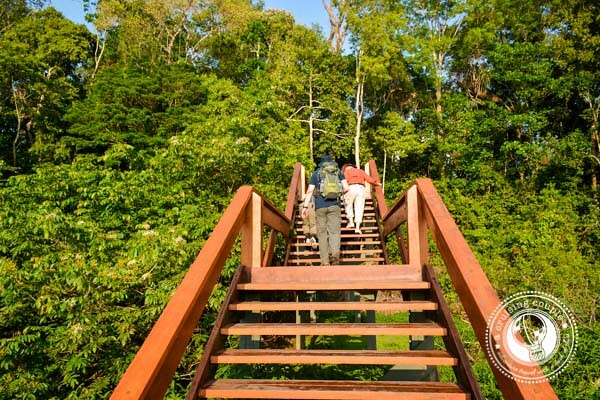 A visit to the Amazon Jungle has been on our bucket list for as long as we can remember. 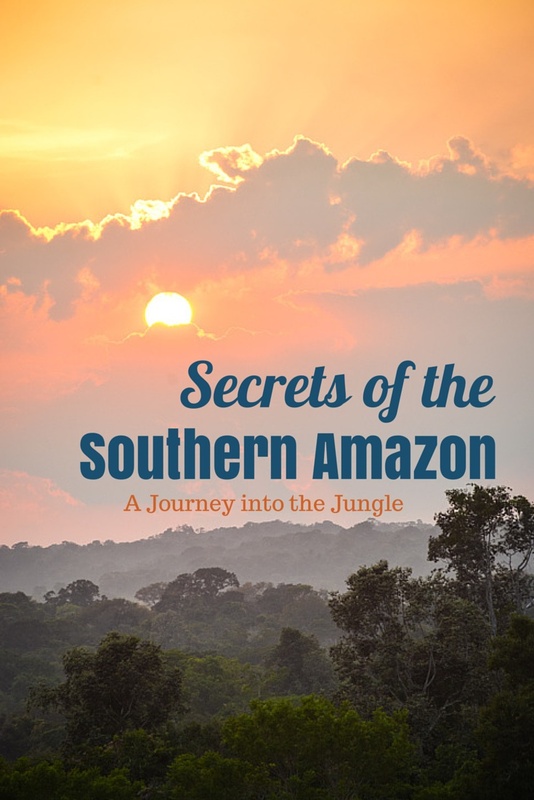 Just the sound of its name…The Amazon…conjured up images of untamed jungle adventures, undiscovered native tribes, and unpredictable wildlife encounters with everything from piranhas to parrots to monkeys to macaws. But as much as we wanted to make the dream a reality, we didn’t think a journey to the Amazon was going to be a possibility on this trip to Brazil. That’s because visiting the Brazilian Amazon can be freaking expensive. 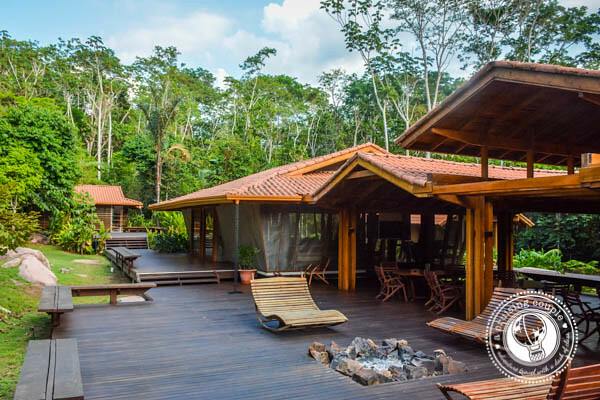 It’s not even necessarily staying at the lodges or going on jungle expeditions that add up, but just getting to the Amazon in the first place that can do some serious damage to your savings. The thing about the Amazon though is that it is absolutely huge—like over two million square miles stretching into nine countries kind of huge. 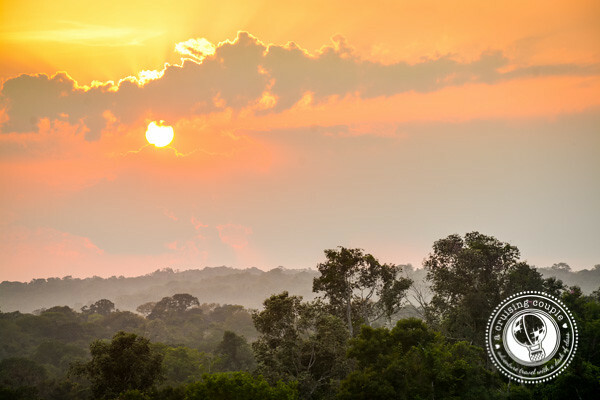 As we did a bit more research, we discovered that we could combine a visit to the southern Amazon and the Pantanal into one trip if we based ourselves in the western Brazilian city of Cuiaba. It would mean we wouldn’t see the actual Amazon River (or the pink river dolphins), but we would still get the once-in-a-lifetime opportunity to hike and boat through what was definitely still the Amazon. It sounded perfect. And in many ways, it was. 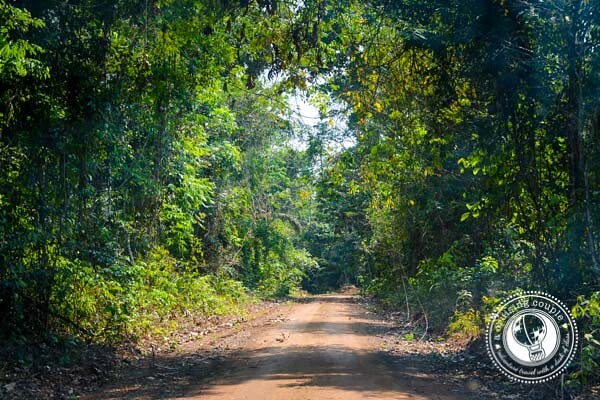 After a heartfelt goodbye to Rio de Janeiro and an effortless flight to Cuiaba, we were soon on our way to Cristalino Lodge, our eco-luxury accommodation in the Amazon. As we bumped and bounced along the pot-holed red dirt road, it was clear that we were slowly leaving all civilization behind. An hour’s drive (and a bout of car sickness) later, we were trading in the four-wheeled vehicle for a small boat that would shuttle us down the Cristalino River and into the middle of the rainforest. Just arriving at the jungle lodge was proving to be half of the adventure and the fun. When our boat docked at the pier we were greeted with a warm smile and a welcome drink. We climbed onto dry land and paused to soak in the beauty all around. Trees towered a hundred and fifty feet above us. Monkeys, birds, frogs and a myriad of other sounds we couldn’t recognize called out from the depths of the jungle. A mystical haze rose above the jungle canopy. And just like that, our Amazonian fantasies were coming to life. We were assigned a guide for our entire time at Cristalino Lodge. Including Dan and I there were only four in our group, a small size we were grateful for. 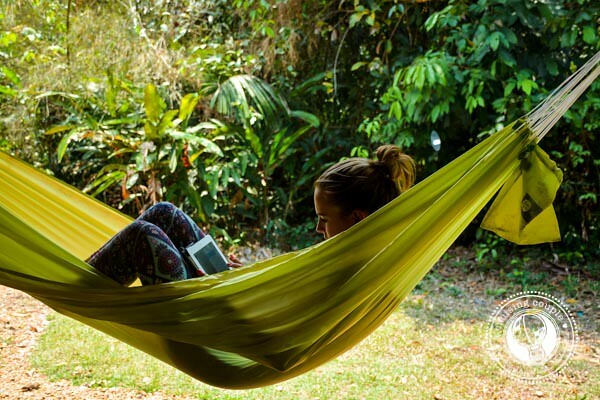 Each day typically included two outings, one in the morning and one in the afternoon, with the hottest part of the day reserved for swimming in the river, lazing in our hammock, or even using the surprisingly fast WiFi if we pleased. Our time was evenly split between hiking through the jungle and looking for wildlife along the river. Most of the hikes we did were around 3km, but they took around four hours to complete. 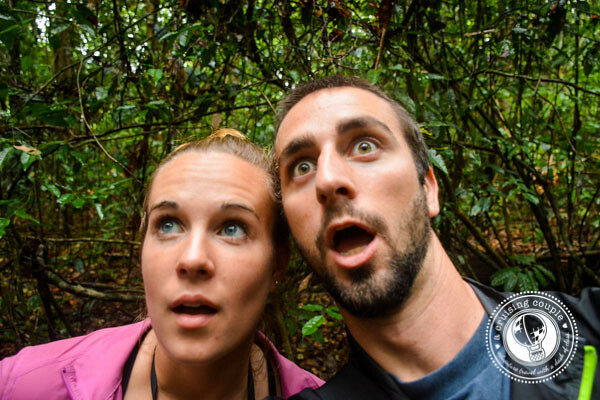 We were in no rush, and enjoyed taking our time to listen to the calls of nature and try to spy various birds and monkeys hiding in the dense foliage. 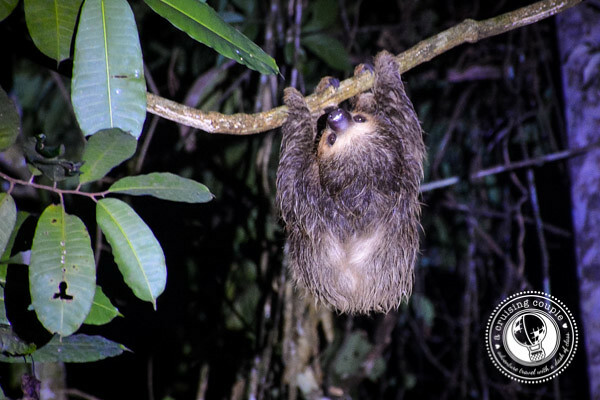 As we noted in our photo preview of the Amazon, finding wildlife is no easy feat, but we were more than satisfied with our sightings. It helped that the Cristalino Lodge reserve is over 28,000 acres and includes both Evergreen and Deciduous forest; the latter group of trees shed their leaves between July and September, making it much easier to find wildlife living on its sparse branches at this time. Just beginning to come face-to-face with the biodiversity in the Amazon was astounding. 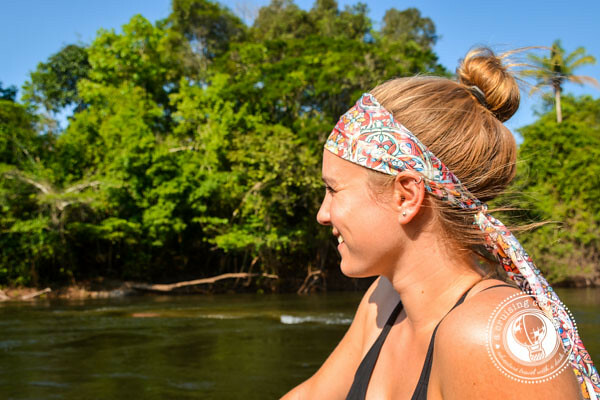 While we thoroughly enjoyed our jungle hikes, the highlight of our time at Cristalino Lodge was cruising along the river. From the open banks it is easier to spot a multitude of birds and animals, including tapirs, river otters, cayman, monkeys and even wild cats if you’re lucky. And we’re not going to lie, sitting back in a boat and letting the driver whiz you around is a refreshing change from hiking in the humid and (obviously) bug-infested jungle. 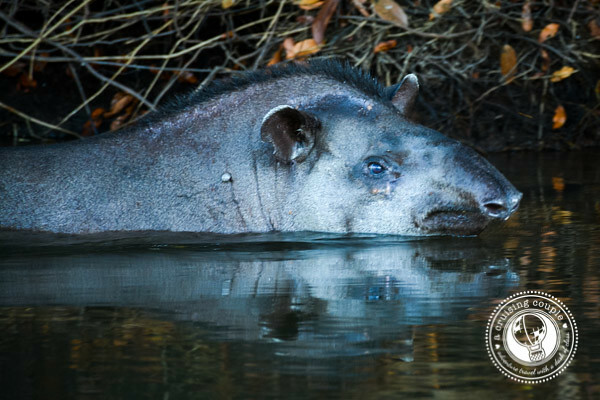 But the primary reason we enjoyed taking to the banks of the river was because if there was one animal we had our hearts set on seeing in the Amazon, it was the South American Tapir. The tapir has got to be one of the most awesome animals around. It kind of looks like a funny cross between a pig and an elephant, but it is actually most closely related to horses and rhinoceroses. 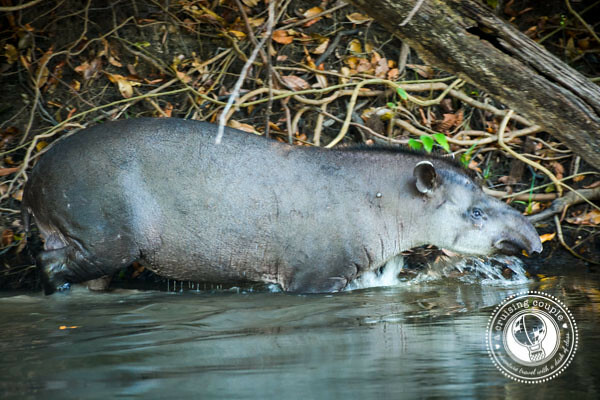 It’s possible to see the Baird’s Tapir in Costa Rica, especially in the Corcovado National Park, but unfortunately we didn’t spot one. 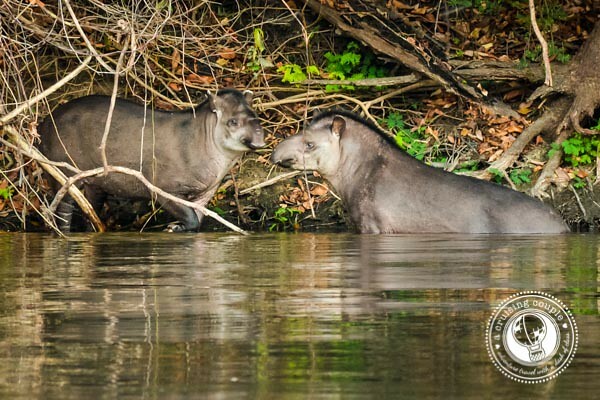 So we were really hoping that this trip to the Amazon might be the chance tapir encounter we were hoping for. We got really lucky. In just one afternoon outing on the boat we spotted six South American Tapirs. A few of them darted off into the jungle the moment they spotted us, but others weren’t so bothered by us drifting down the river. They continued to walk and swim and do their thing as we giggled and took photos of the delightfully wonderful creature. One of the best parts about staying at a secluded jungle lodge like Cristalino is that you don’t even have to leave the grounds to find wildlife. For example, one early morning we heard a rustling outside our bungalow. I thought it was just another person getting ready for our sunrise hike, but Dan wasn’t so convinced. 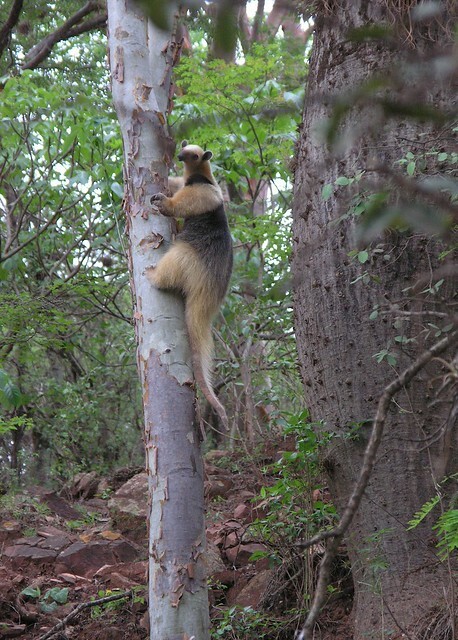 He grabbed a flashlight, followed the noise and discovered it was a Tamandua munching on leaves in a tree! Another evening after dinner we spotted sloths and night monkeys just hanging out a few meters away from our bungalow. 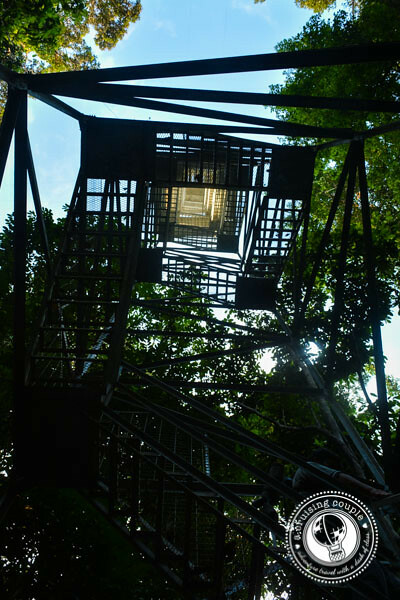 So we’ve talked about hiking and boating, but there is still one crucial component of any visit to the southern Brazilian Amazon: the Cristalino Towers. Two vertigo-inducing, 50-meter towers are at the lodge, allowing guests to get a bird’s eye view of the jungle canopy—and to attempt to wrap their head around the immensity of the Amazon. Our final morning we woke up at 4:30am to make it to the top of the tower in time for the sunrise. If climbing up all those steps wasn’t enough to wake us up, the astoundingly stunning sunrise certainly was. The perfect ending to our long awaited Amazonian adventure. Want to learn more about what it was like to stay at Cristalino Lodge? Be sure to read our full review where we talk in detail about the lodge, the food, the guides, the history of the reserve and more! Have you been to the Amazon before? Is it on your bucket list? What other jungle adventures have you had? We were guests of Cristalino Lodge. All thoughts and opinions are our own. Wow, what a cool eco retreat, I would love to visiting the Amazon some time in the future and this is just the place to stay! The Southern Amazon is an amazing place that’s full of surprises. Cristalino has really managed to build something special… and in the middle of the jungle! Haha, never looked at it that way. I totally see it though! I am yet to go to the Amazon jungle but I did spend 3 days in the Amazon Basin in the Pampas of Bolivia. We saw pink river dolphins and I tried to swim with them but they weren’t too keen and didn’t stick around. We didn’t see tapirs – what crazy looking animals! I’ve never seen a tamir in real life, it’s such an interesting and curious looking animal. Needless to say that your stay at the eco retreat, your Amazonian adventure and the amount of wild animals you saw, are something that I’d LOVE to experience myself, it’s not an opportunity that happens every day. Very cool trip. I’ve always wanted to go the Amazon too. I just read this post with my kids and they are freaking out. “I wanna go, I wanna go!” Looks like I’ll have to start planning. We’ve never been to the Amazon. But it’s definitely on our bucket list. Even more after reading this post. You make everywhere look so photogenic, guys. Wow, seeing the tapir looks like a pretty exceptional experience and a very unique creature. Great photos. 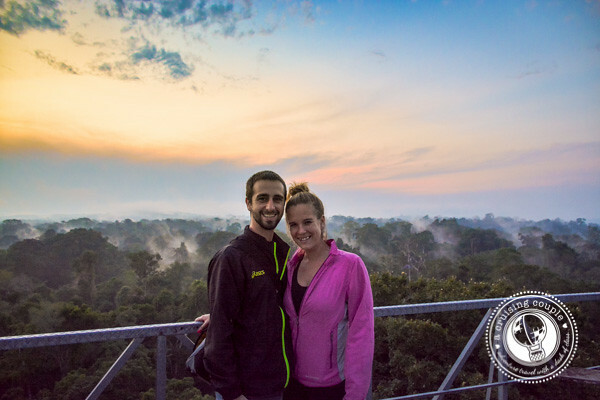 It is fabulous that you’ve been able to do this trip, the amazon seems like such an exclusive thing to do for many travellers and I think you’ve found a perfect way to do it. The size and scale is something I think lost on many of us until we actually get a chance to experience it. The Guy recently posted…Which Is The Best First Class Cabin? your photos are amazing (as usual). I would walk so slow through the jungle because I’d probably be so overwhelmed by it all. That’s so crazy about so much of our medicine coming from the rainforest, definitely one of many many reasons we should preserve it. 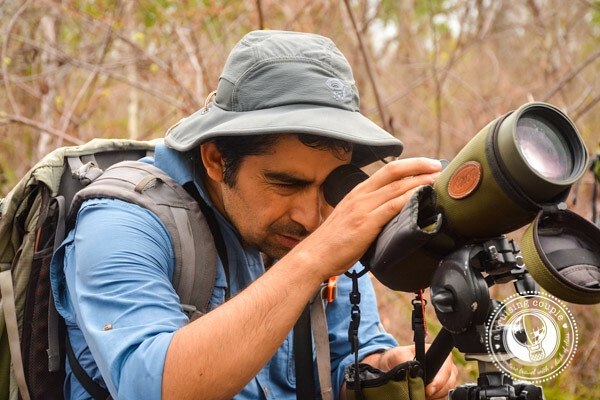 It’s incredible to think about what may waiting to be discovered out there in the Amazon. It is an amazing area that deserves to be protected. Great post! I really want to get to Brazil for many things, but the rainforest is one of them. Glad you were able to go. We did a short trip when in Peru. It is probably still one of my favorite trips! After all that hiking I can see why you were glad to start the boat part of the journey. Sounds like a spectacular — and memorable — adventure. Terry at Overnight New York recently posted…Hotel Wales: Who’s Mac Conner? Wow, your Tapir photos are amazing! You were truly blessed that day to be able to photograph several Tapirs. We were very fortunate to see a sleeping Tapir in Corcovado National Park. I thought I would have to pinch myself to confirm that we were really seeing one. It’s a very special moment when you encounter such shy wildlife. That’s amazing you were able to sneak up on a sleeping tapir! That must have been a very intimate encounter. We stayed in a Peruvian Amazon lodge on our honeymoon in 1982. No electricity. No glass windows. We saw pink dolphins. Definitely not in Kansas. Hi! Beautiful pictures from the Amazon! I live in the Amazon region at Ecuador and visited the rainforest many times. I really love it, the rainforests such a beautiful place and the wildlife amazing. This looks like a seriously awesome trip and the Amazon is one of the last places I would expect to hear someone say has fast wifi!